*sigh* I damn sure I hope I don't regret doing this. It's the new year, and I want to start it off on a good note. I have always recognised that bloggers have a lot of potential to do good for charity. In my capacity, I'm always happy to lend publicity to several charitable causes on my blog, so long as they are legitimate and transparent. 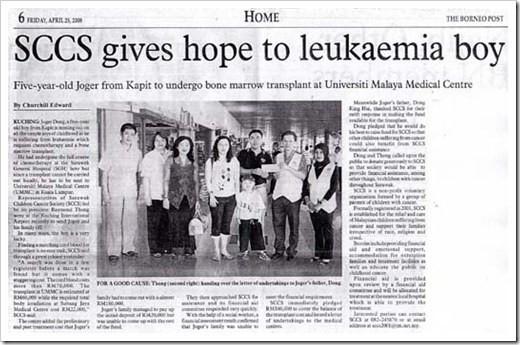 But late last year, I was approached by folks from the Sarawak Children Cancer Society. The society related strongly to me for two reasons. One, I know they have been very active in providing support and care for childhood cancer sufferers, and cancer support is one of those things I keep very close to my heart. Having gone through the pain of losing my father to kidney cancer, I know what a dreadful experience it is, and I would never ever wish that upon even the worst of my enemies. Secondly, the society is based in Sarawak. It is a fact that Sarawak-based charities don't receive as much attention as their Peninsular-based counterparts. Personally, I find that very unfortunate considering Sarawak has a very large rural population, many of whom still live in poverty. They are the ones who needed help the most, and yet there aren't enough of us who reach out to them. 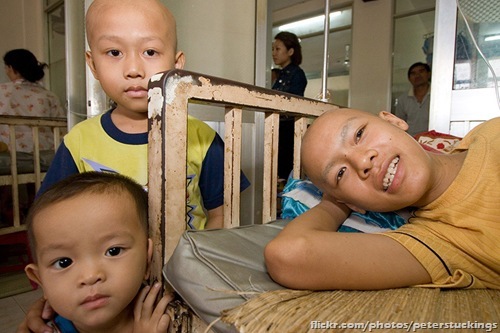 Due to lack of medical facilities in the rural areas, many parents of childhood cancer sufferers frequently travel long-distances, hours at a time, just bring their sick children to Kuching to seek treatment. As a voluntary organisation, Sarawak Children Cancer Society has always provided care and support for the poor and needy in the State. One of the best things they come up with among many fantastic ones, is the Children Cancer Centre located minutes away from the Sarawak General Hospital. Families of outstation patients are offered to temporarily stay in the Centre while their children undergo treatment at the hospital. Food, amenities, counselling, and sometimes financial support are all provided by volunteers and their three full-time social workers. And this is just one of the many things the SCCS do to help lighten the emotional and financial burden faced by these families. Childhood cancer is in fact a very curable form of cancer. 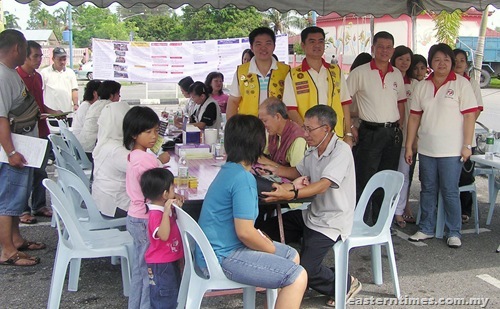 Unfortunately, many sufferers in Sarawak needlessly die every year either due to lack of funds or access to hospital. 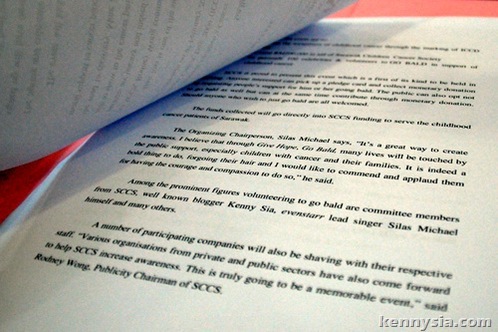 That is why I am very happy to give my support to the SCCS. Of course, the running of the Children Cancer Centre is not free. Worse still, with the increasing number of outstation patients utilising the facility, their resources have been stretched thinner a plate of roti tisu. Someone has to pay the bills. Most of the time, this is done through public donation and the many fund-raising activities that they organise. They want me to shave my head bald for charity. "What! Wait, wait, wait. I cannot confirm yet. Do I really have to do this?" I groaned. 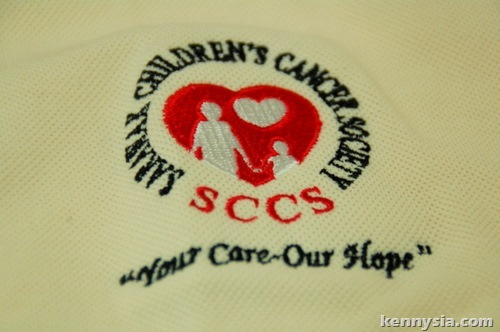 "Well, it's to create the awareness," said Rodney Wong, the SCCS publicity chief when he pitched the idea to me. 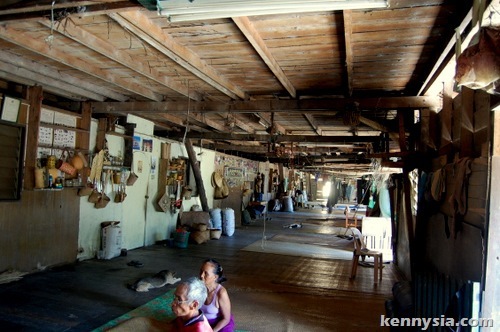 "We can raise funds doing food fairs and stuff but few people would pay attention. Once you say 'Kenny Sia is willing to shave his head bald for charity', immediately everyone takes notice." I say it's a bald bold move. I never like saying no to people. In this case, I find it very difficult to give up my hair eventhough it is for a good cause. Everybody is vain to different extent, including me. I go through great lengths to preserve my hair. I'm already not very good-looking, but if I go bald I'd become uglier. I certainly don't want nother adjective people can use insult me! "Rodney, I spent RM150 a month on Propecia just to keep my hair from dropping. And now you want me to lose all my hair?" "You can think about it," replied Rodney. "Our target is to raise RM200K in total. But if you're in, I think you can raise RM50,000 no problem." 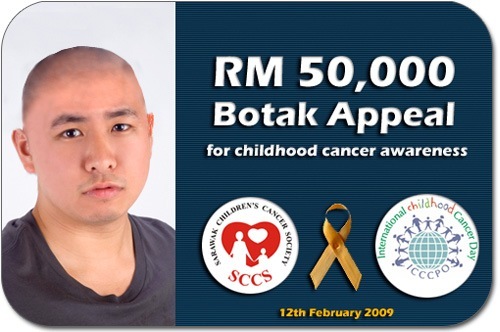 RM50,000 to give the hope of survival to children suffering from cancer, in return for all of my hair. Suddenly this does not seem like such a difficult decision to make anymore. "Alright Rodney. Let's see how generous kennysia.com readers are then," I said with a painful smile. "If I can raise RM50,000 by 12th February, I will shave my head bald." And so the race is on. The deadline is Thursay,12th February. The target is RM50,000. Everyone from all parts of the world can donate, and all major forms of payment are accepted. Once we hit the target, I guess I'll be sporting a new hair cut (or lack there of) just in time for Valentine's Day. Guess I will be date-less for the next 12 months, at least. It's too late for me to back out now. I've already made my promise to the SCCS. Now it is all up to you, readers of kennysia.com to decide whether I can keep my hair. Good for you. Keeping my finger crossed that you will hit the target. RM50000 not a small sum. Btw... I need to know if the money donated is tax exempted? Yes it is! When you fill out the pledge form, make sure you fill out your address and indicate that you want a receipt mailed to ya. All donations are tax exempted here. I guess it works there too. WAY TO GO! I am going to write a blog post [b]THIS VERY MINUTE[/b] and help spread the word, and post in other forums so that you get donations in USD! Wow! Such a humble move! Kudos to Mr Kenny! You remind me of one the articles on Sunday Star Mag, where a young girl goes against her parents and shave her head to make a fellow friend who has luekimia to not feel awkward. can i know what's the bsb number of the bank? I'm doing online transfer. Just the bank account is insufficient it seems. no worry, you look great in bald. yeap. you can make it! 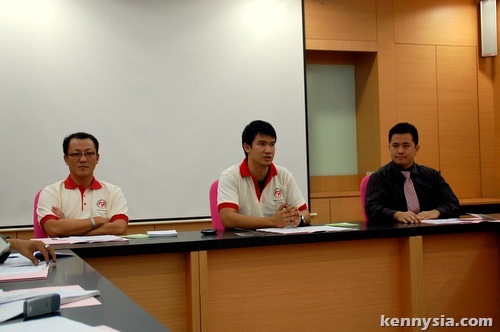 kenny, u got the heart!as a sarawakian, i support u !!! Actually, I kinda wanna see you bald. >. kenny, you touched my heart once when you wrote abt World Vision Malaysia. Now, you touched my heart again. I really sokong what you're doing. God will bless you! "rambut boleh tumbuh, nyawa x boleh tumbuh lagi kalau hilang ..."
Your hair will grow back, but not lives. I appreciate that noble effort of yours, Kenny! Kenny , i will post it =). i will help =) , if the money is over RM50,000 , i shave botak together with you , ON BO ? don't mind me using the photo of your botak head on my blog. since there's still no smaller version available at your gobald page, do let me know when you have a smaller-sized badge available. go kenny. do your best. bald is cool! Kenny, Kudos to your generous deed. Go for botak ! You save life. since i havent done that, might as well give to the kids lar. All the best for your fund raising eh! Go bald? 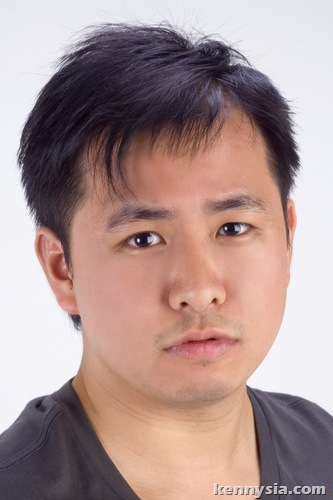 Walao, don't get yourself jeopardized that you need 2 or 3 years to recover the hair you have now. Your character is not determined by how much or how thick your hair is. A magnanimous heart does it. good move! can't i donate by credit card, if i don;t have paypal i cant right? but pls, everyone! dont donate just yet. wait till kenny's bald, then we donate!!! Good luck on the RM 50,000! Hey Kenny, I'm sure that your Dad will be very proud of you! You've done him proud even if this idea just happened to cross your mind. As for the baldness thingy, to me it doesn't matter that much anymore. good luck with ur fundraising! Will try to donate by deposit. my hat's off to you Kenny! Please keep the hat for me. I'd need it when I go bald. 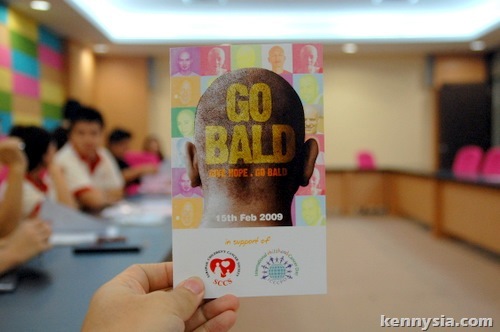 hate2c u bcom BOH ENTAU bt4charity.. go bald ba.. cz ur boy so is ok2b botak.. +U kenny.. This is excellent Kenny. Thanks so much. 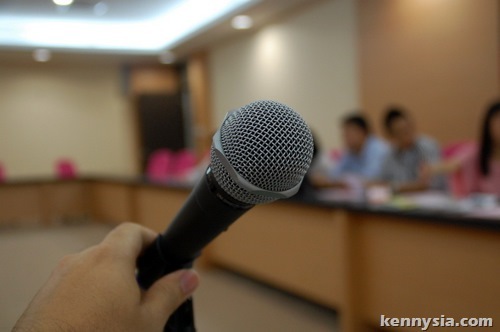 For those who don't know me, I'm the dude sitting next to Kenny in the press con picture. The organising chairman of this project. Let me assure you that 100% of the proceeds (as in all that u donate) will be going straight to the Sarawak Children Cancer Society. And it will all be used for great deeds. Just a quick update on the proceeds received thus far. Since I published this entry, 19 people have donated a total of RM3,727. Not a bad start, but plenty of improvement needs to be made 'cos that's only 8% of the target! I'm in the midst of programming a 'scoreboard' to put up on my blog. whats the purpose of saying that for the sake of just saying that?? Will try to donate some later...good move man...they are right, rambut hilang can grow, hati hilang cannot grow anymore...everyone should try to help...webcam the cutting process and post it in youtube, then we can see the process of you getting bold...:P...good luck man!!! Yo! Kenny!! I'm going bald with yea!! Too bad, I'm not raising any donations, just going to shave off my head to gain awareness. Shave off your head even if you dun reach la~ save the shampoo dude! I thought about shaving my head for charity also back in 05/06. Then i was advised against it because of the pageant activities lined up. Maybe it's time to revisit this option! Awwww, that's a nice deed you're doing. Well, I don't have the money to donate since I'm still a student but I guess people, if you're working, why not chip in a little. Helping them once in a while doesn't hurt, does it? I was thinking of shaving my head bald to create awareness in my school but I'd be expelled cause they do not allow bald headed students. Sigh.. What a school..
Shaving will probably cure dropping hair. When all else failed I shaved mine and it's been good since. After it grows back refrain from using anything except shampoo weekly. Natural oils your body produce is better than anything you can buy. Surprisingly many women can't resist caressing your bald noggin. More details on How-to contribute will definitely help. indeed good start of the year, hopefully all 100% of the money will go to the foundation. I just wanted to applaud Kenny for his courage in doing this. In fact, I have been in contact with him on this for about 3 months and its was touch and go before he finally consented. So it's not an easy decision. Will help u spread it! its not a big deal. even sharifah amani did it in her film. if a girl can do it, you can do it too. haha... im gonna shave as well!!! aussie has this event as well... btw... IM A FEMALE!!!! im gonna shave!!! excited weH!!!! Speechless! well done kenny, i support your cause! you look like a monk when you're bald. thats a compliment . im with naeboo. 100k la! Ask Mr. Silas Martin to shave his head first hahaha.... oi Silas what r u doing there?? now doin charity meh? why, local gigs not so 'laku ' nowadays meh?? it sure to be the next "in thing"
You will be definitely going bald! If you shave your head, I will find out where you live, and personally slap you to death! i support you..it's more important to reach the target of funds rather ur botak hair! good job!i'm proud of u! i think can hit 100k easily..
Congrats on the good deed!! 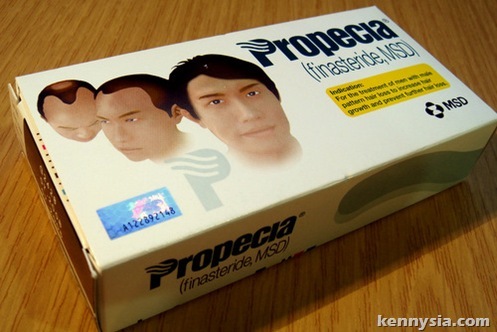 On another note, do you really know what PROPECIA can do to you? It has permanent sexual side effects!!!! Whoa.. other than camwhoring, I never thought you have such a place in your heart? Well kenny.. GOOD JOB! Ermmm let's say donations managed to reach RM25,000. Does this mean that you'll shave 1/2 bald ?? Also, the International Childhood Cancer Day is on Feb15th. Why did you set an earlier date ?? 3 days is a lot okay !! It feels like you're trying to lessen the probability of shedding any of your precious hair !! maybe coz so that he has a few days' time to calculate the money received and do a final tally and so on?? You can cut short short "kiwi" hairstyle what... nice to rub also, definitely popular with girls. Your hair will grow back to normal within 4-8 weeks. It's never been an issue being bald. Lots of celebrities are/were bald. Even some of the female ones. I'm not gonna use Britney as an example. I'll use Natalie Portman instead. Why are you (a male) a bit reluctant to shave your head? It's no big deal really. I've done my bits. All the best, Kenny. y i feel like ur blog is not so interesting anymore? you kuku, this blog main objective is not being interesting. can't you read or understand the contents? I WANT TO SEE KENNY BALD! Shave everything from head to toes ! how i wish i could do something kenny...despite i am just a student with no income at all...but i shall support you too!! Hope you'll reach the targeted RM50 000 or higher. I'm happy that you're willing to go bald for the kids. I'm sure that doing this will give you long-term satisfaction and even more funky things to talk about with people. I personally think bald is a pretty good hairstyle. Think Halle Berry . Oops. Should've gotten a guy example. Aiyah. The pic in your post also not bad. you are so much useless. if you have the heart to make an effort for charity, that is nothing to say IF only certain target is reached. imagine changing lives with your hair is so much doubtful to you. brother kenny, shame on you. millions of people will never hesitate. I have been an avid reader of kennysia.com for a few years and this is my first time posting a comment. I am a student and can only afford AUD1.00 to give you, but when converted it is ~RM2.50, enough to buy a bowl of kolo mee in Kuching. As the saying goes, "Little little become mountain". Every dollar, ringgit and cents make a difference!!!!! GO KENNY GO!!! HIDUP SARAWAK!!! Done my part. Keep it going, guys. hey , i got swimming competition on the 15th . and i aint sure if i cn go o nt yet . is it possible to go shave on the 12th ????? Shave your nuts and i definately will double my pledge...! Shave your hair Kenny... I might donate more if you shave it clean clean...ka-ching(kilat)...HAHA..
if i plan to donate on feb 12th, do i fill in the form before i donate or what? why dun you add more cimbclicks and maybank2u donate way? a student like me dun have credit card nor live in kuching. how do i donate then? you make super impose on that bald pic.. it's look almost real but u wrong bout perspective of your bald head. it is really tough decision. but i really salute you for doing it for a good cause! don't worry, you'll look fine. Where a young girl goes against her parents and shave her head to make a fellow friend who has luekimia to not feel awkward.